← A New Vegan Website …. Of all the many gay-themed Web sites out there, this one, Woolf and Wilde, is one of the Grumpy Vegan’s all-time favourites. Obviously named in honour of two literary icons, Woolf and Wilde bring together photographs depicting intimacy between men sometime ago with poetry which adds intense meaning and fresh insight. 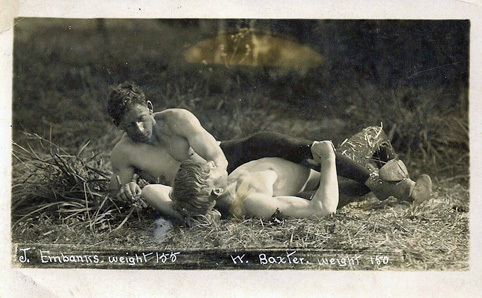 Were these two men wrestling in the countryside lovers? Indeed, are they wrestling at all? The poem suggests that they maybe but we will never know. Which is fine by the Grumpy Vegan. Because the look between them and the body language suggests intimacy between men which, if it were more prevalent today, would surely help to dissolve all that stupid, silly macho nonsense we all have to put up with for no good reason. This entry was posted in The Grumpy Vegan Life, Thinking and tagged Website of the Week. Bookmark the permalink.